A capo is on practically every guitarist’s recommended accessory list. Why is that? Does every guitarist use a capo? No. But do many guitarists use them? Absolutely. Whether you’re an amateur or a pro, there are no rules against using a capo. You are not a lesser or better guitarist for using one. It really just depends on the scenario and what’s required of you as a guitarist. Let’s explore how to use a guitar capo and why you’d want to. 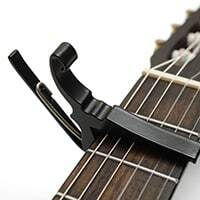 How Do I Use A Guitar Capo? Why Would I Want To Use A Guitar Capo? 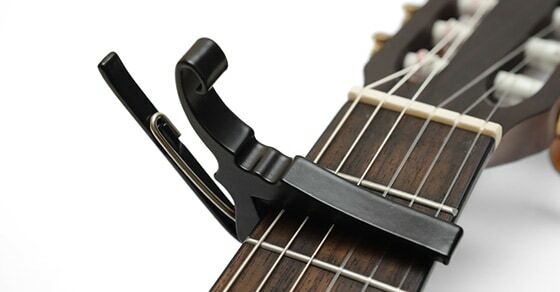 In essence, a capo a small clamp that’s used to “move the position of the nut.” The nut of the guitar is the small piece (often made of plastic, graphite, brass, bone, ivory, or other materials) holding the strings just below the headstock. The lowest note on a typical six-string guitar is always the sixth string open. You can’t go any deeper, but you can go higher. When you hold down the first fret, you get an F note instead of an E note. That’s what I mean by moving the nut. You can have the capo act as a finger barring across all six strings. Here’s another way to look at it – when you play a barre chord, you usually use your index finger to “barre” across several strings (typically four to six strings). When using a capo, your capo can serve as your barre, freeing up your other fingers to form chord shapes. 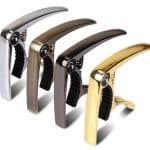 The common types of capo include: strap-on, trigger-style, spring-loaded, toggle, and Shubb. As I’ve already explained, a capo is like a clamp. I’m going to assume you have a trigger-style capo, but the same basic principles will apply no matter what kind of capo you’re using. By default, a trigger-style capo is in the “closed” position. You can’t place it on your neck as-is. But when you hold the longer end in your hand, and apply pressure to the “curved” arm, the capo’s mouth will open. Now you can place it at a specific position on the neck and gradually release the arm to let it clamp down on it. Other styles of capos are a little less convenient to move to different positions of the fretboard, because you’ll need to screw it down, wrap it around the neck, and so on. But for all intents and purposes, they work just as well. Now we just have to make sure the capo is sitting correctly on the neck. The first consideration is proximity to the fret. Since the point of a capo is to act as a barred finger, you’ll want to put it close to the fret, but not on it. It’s okay to leave a little bit of distance between the capo and the fret, but I would suggest not putting it in the middle. Closer to the target fret is better. Next, it’s always a good idea to check that the capo is actually applying pressure to the strings as it should be. This is what a capo is designed to do, but it’s best to double-check before you start playing. It could be sitting incorrectly on one of the strings, in which case you might get a terrible buzzing sound as you’re playing, and not even notice until you get into a song. If you know what a capo is, you probably associate it with singer/songwriter or acoustic guitar players. Though it has that image, a capo can be used on an electric guitar, and even pro sessions guitarists sometimes use one. Transpose on the fly. Let’s say, for example, that you’re a session player in a band. The singer doesn’t like the key the song is being played in, and asks you to change it. 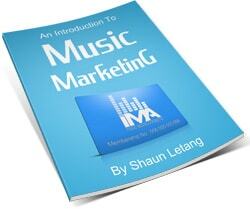 You can easily transpose to another key using a capo without having to learn or change all of your chord voicings. A famous example of this is The Eagles’ “Hotel California”. Originally, it was in the key of Em, but when it was moved to Bm, capos went on. Layer guitar parts. With singer/songwriter circles or open mics, it’s not uncommon for acoustic guitar players to be jamming together. But if everybody strums the exact same chords in the same position, you end up limiting the sonic spectrum. There isn’t necessarily anything wrong with that, but you can offer up a little more variety by playing the same chords in different positions, and a capo makes that easy. Explore creative ideas. Maybe you’re just looking to get out of the regular routine. Perhaps certain chord voicings are starting to get a little tired and boring. Using a capo can inspire new chordal and musical ideas. Although this may not be the “intended” purpose of a capo, there are no rules against using it in this way. And sometimes a capo will serve multiple functions at once. Fundamentally, any guitarist can learn to play with or without one. But once you’ve written a song with the use of a capo, you’re pretty unlikely to attempt the same chord voicings in the open position (with barre chords). When you need to figure things out on the fly, or when you need to change the key of the song to fit the singer (which might be you), it’s a handy tool to have. When asked whether or not the use of capos was cheating, award-winning fingerstyle guitarist Phil Keaggy said something along the lines of, “well, frets are like cheating too.” Here’s what he meant by that comment: originally, stringed instruments (such as the violin) did not come equipped with frets. Frets are devices that make it easy for you to stay in tune across the entire neck. Other stringed instrument players, such as cellists have to learn exactly where their fingers go, and be very precise with their finger placement to play in tune. Cheating or not cheating? You decide. 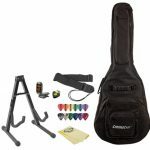 But no matter how good I get, you’ll probably always find a capo or two in my gig bag.